Achieve your accredited TESOL qualification in as little as 2-3 weeks. Get started teaching in Asia, Africa or Latin America as soon as possible. Build on additional specialisms later if you wish – just see our 20 or 30 hour programmes below. After downloading your first module (there are 4 in total) you can work offline when you want to. We've also included live teaching segments, podcasts and links to some of the top EFL material to keep you interested and motivated. When complete, upload your modules via your student area and get full feedback from your tutor. We've made it so easy for you to follow and complete. This course will typically take you between 6-8 weeks to complete, but we go at your speed and allow up to 6 months for course completion for maximum flexibility. Applicants should be 17 years or older with a good standard of education or significant life experience. If you would like any advice on this, please contact us on +44 (0) 1392 411 999. Important! You must enter ELTON in the Field "Where did you hear about Global English?" 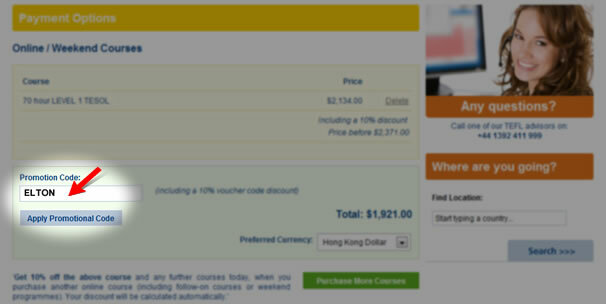 of the enrollment form in order to get the 10% off discount.